Take 3 Days FREE at Roots Philly! Become the best version of yourself possible! Jiu jitsu helps you get in shape, increase confidence, and learn how to defend yourself in any situation. Try it out for 3 Days 100% Free and discover the power of Jiu jitsu for yourself. Whether you're a world-class athlete or just getting started, we've got a class for you. F.I.T (functional interval training). Get sweaty and in-shape with this body blasting workout. Brazilian Jiu jitsu. Learn the most powerful martial art on the planet. We offer fundamental, women's only, and competition classes. Thai Boxing. Strike with precision and power in our Muay Thai Kickboxing classes. NoGi Submission Grappling. 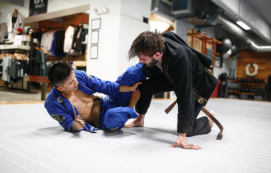 Amplify your grappling skills with No Gi classes that prep you for any situation. 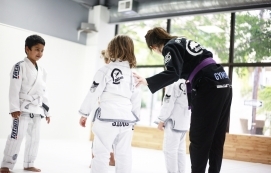 Kids Brazilian Jiu jitsu. Give your kids a jumpstart on life with the confidence, self-discipline, and social skills they deserve. Ready to get started? Click here to start your FREE 3-days right now. Check out our beautiful facility and the various classes you can take during your FREE 3 days. Get your FREE 3 DAYS and discover the benefits of Jiu jitsu today.